A former KGB agent (L) and a former reality-television star (R) discussed geopolitics at the G20 summit on Friday. So, in other words, Trump’s response to the Russian government’s interference in last year’s presidential election, with the adversarial intent of helping Trump get elected, was to consider working together on election cybersecurity in the future. 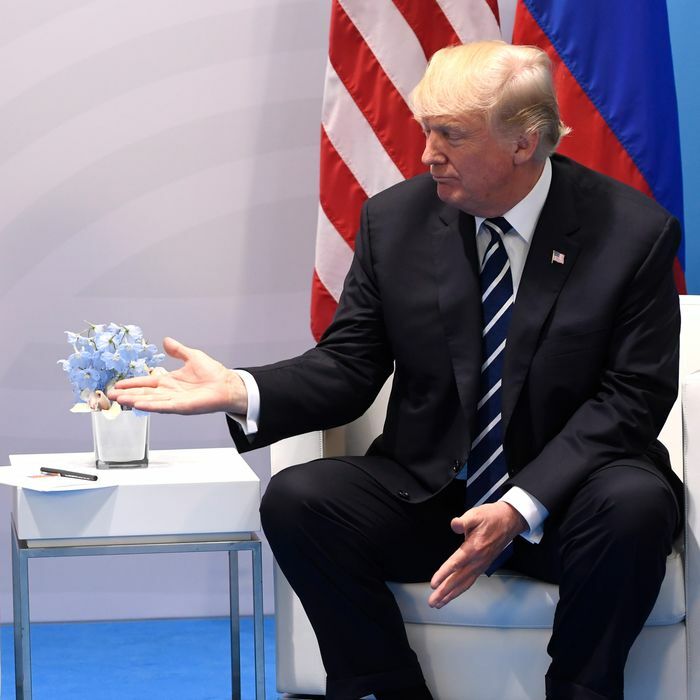 While little of what President Trump said on Sunday morning makes much sense, he did seem to clear up some of the confusion surrounding the official Russian and less-official U.S. versions of what happened at the meeting. The official Russian version, offered by both Putin and Russian foreign minister Sergey Lavrov in press conferences, is that President Trump had asked Putin whether or not Russia had interfered in the U.S. election, Putin had denied it, and Trump had accepted that denial. Lavrov said that Trump had not been confrontational and had assured them that many in the U.S. had been “exaggerating” the Russian meddling without proof. Putin said on Saturday that Trump had asked many questions about the election interference, but that he thought Trump seemed satisfied with his answers and denial. Putin also encouraged reporters to ask Trump himself about what he thought, and when told that the White House hadn’t released any information about the meeting, Putin joked that he would instruct the Trump administration to fix that. In the absence of an official White House account of Friday’s big meeting, Secretary of State Rex Tillerson, who was the only other U.S. official to attend it, claimed that Trump had repeatedly pressed Putin on the election hacking. The New York Times reports that Tillerson told an associate that Trump even opened the meeting by confronting Putin about the election hack, saying, “I’m going to get this out of the way: Did you do this?” — despite the fact that U.S. intelligence officials have already concluded that Russia had. According to Tillerson, the two leaders then had a “very robust and lengthy exchange on the subject,” but that they were “rightly focused” on how they could move forward, beyond the “intractable disagreement” over the election hacking. Tillerson also said that sanctions were discussed in the meeting, referring to the current congressional push to pass new sanctions on Russia in retaliation for the election hacks. That bill, which the White House has been trying to water down or block, is currently being held up in the House of Representatives. On Sunday, Trump contradicted Tillerson, tweeting that sanctions “were not discussed” at the meeting. Ultimately, after looking at Trump’s comments on Sunday morning, as well as the spectrum of comments from his cabinet members, it seems reasonable to assume that the Russian version of the meeting — that Trump accepted Putin’s assurances that he had nothing to do with the U.S. election hacks — may be credible. That’s particularly apparent if Trump’s takeaway from the conversation was that it would somehow make sense for the U.S. and Russia to work together on election cybersecurity, or that Putin’s vehement denial was in any way sufficient. He certainly didn’t deny that he had accepted Putin’s denial, which, even in a sloppy tweetstorm, would have been easy to do. At best, Trump’s baseless conclusion remains that “nobody knows for sure” what happened with the election interference and so it’s time to move on, which is conveniently obtuse for a president who directly benefited from that interference and whose inner circle is under investigation for possible collusion regarding the matter. I think this is a very important step forward that what we want to make sure is that we coordinate with Russia, that we’re focused on cybersecurity together, that we make sure that they never interfere in any democratic elections or conduct any cybersecurity. And this is like any other strategic alliance, whether we’re doing military exercises with our allies or anything else. This is about having capabilities to make sure that we both fight cyber together, which I think is a very significant accomplishment for President Trump. It is definitely not much of an accomplishment, however, if Russia is still launching cyberattacks on the U.S. On Saturday, a Washington Post report indicated that U.S. intelligence officials have now concluded that Russian hackers have successfully penetrated the computer networks of nuclear power and other energy companies in the U.S.
Update: It’s also not much of an accomplishment if the president, after less than a day of criticism and ridicule, hastily admits that the “impenetrable” Russo-American cybersecurity alliance can’t actually happen, as Trump did on Sunday night.